Aviv Kochavi arrives with outgoing Chief of Staff Eisenkot to Western Wall, where they pray and place notes in the stones of the wall. 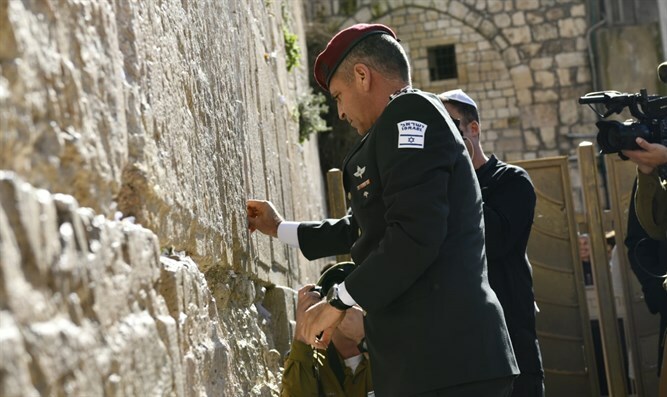 Chief of Staff Lieutenant-General Aviv Kochavi arrived at the Western Wall plaza on Tuesday afternoon, together with outgoing Chief of Staff Gadi Eisenkot. 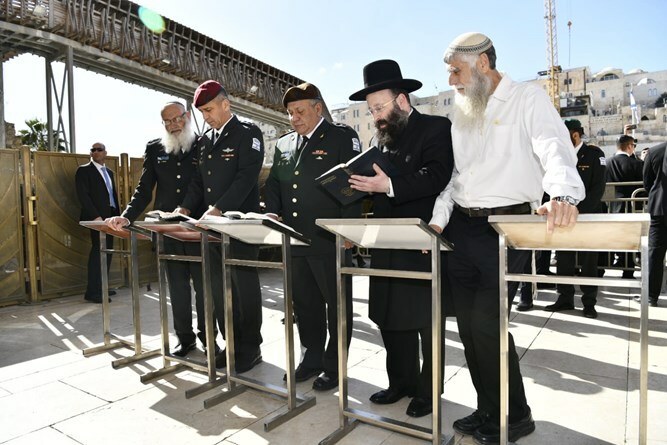 The Chief of Staff was accompanied by Rabbi of the Western Wall Shmuel Rabinowitz, Chief Rabbi of the IDF Eyal Karim, and Director of the Western Wall Heritage Foundation Mordechai (Soli) Eliav. Kochavi and Eisenkot were welcomed by hundreds of worshipers from Israel and abroad who were at the Western Wall Plaza. The Chiefs of Staff recited chapters from Psalms, the prayer for the safety of the soldiers of the IDF and for the peace of the state, and the prayer for the prisoners and MIAs. Afterwards, they prayed a personal prayer and planted a note between the stones of the Western Wall. The Western Wall Heritage Foundation gave Kochavi and Eisenkot a book of Psalms with the imprint of a seal discovered in Western Wall excavations on the cover. The seal served as the symbol of Hagav, a military commander of Judea in the days of the First Temple.